I haven't been on here for many months. Anyways I see some concerns about my setup the OP referred to. When I first set up what I referred to as a pit (where the vent meets the water level inside the dam), I had an 18 inch dia. x 36 inch long piece of plastic culvert pipe with an 18 inch grate flush with the dam. When it went into siphon, it was really loud. So I cut the pipe off 12 inches below ground level and capped it while running a 4 inch pipe over 3 feet with an elbow then up to the surface with a vent cap flush with the ground. Now you can't hear it unless you are on the dam. The 4 inch pipe acts as a muffler. In my picture of my 2 intake pipes, I took the picture before I glued on the caps. I drilled enough holes in the pipes to equal over 2x the flow capacity of the pipes. With out the vent to the surface, the system would air lock. Which I know someone already mentioned that. You could make this system with one pipe instead of two. When I designed my system, I figured that I needed around 50 square inches of pipe for my calculated rainfall per acres of watershed. 8 inch pipe = 50.24 square inches and 6 inch = 28.26 square inches. The cost of 6 inch pipe was half of the 8 inch. Two 6 inch pipes gives me 56.52 square inches of pipe. So I decided to go with two 6 inch pipes. Thanks for providing additional real life experience with your system! Could you please clarify what you did when you said “So I cut the pipe off 12 inches below ground level and capped it while running a 4 inch pipe over 3 feet with an elbow then up to the surface with a vent cap flush with the ground.” I understand that you cut the 18” pit 12” below ground and capped it, but I’m not clear on the 4” inch pipe over 3 feet with an elbow. Where is the 4” inch pipe over 3 feet connected? Is it on the vent supply pipe (sock pipe), 18” pit or vent pipe? Sorry it took me so long to reply, my internet service has been down. With my first design, I think the 18" pit actually amplified the noise. I had originally thought I would have to run the 4" pipe out into the woods about 150' away to counter the noise. I only had a shovel so I quit at 3 feet and it worked. I made a drawing that isn't exactly to scale of what I did, but maybe is representative of my design. It has been working for 8 years now. Now I see what you were saying! Thank you for the drawing! As they say a picture is worth a thousand words. You wanted to reduce the amount of noise and thought you were going to need to move to the far end of the dam. However, after moving the 4” vent pipe a little over 3’ the noise was dampened (muffled) enough by the smaller 4” pipe. Btw your drawing is much neater than mine. How do you manually prime the siphon if you wanted to do a drawdown? I have a 6 inch drain with a ball valve that I can use to draw it down. I also have a 4 inch valve for my irrigation. WOW! That is a fantastic idea! Are these pipes separate from your dual 6” siphon? I’m assuming that the valves in the picture above are located at the backside of your dam? 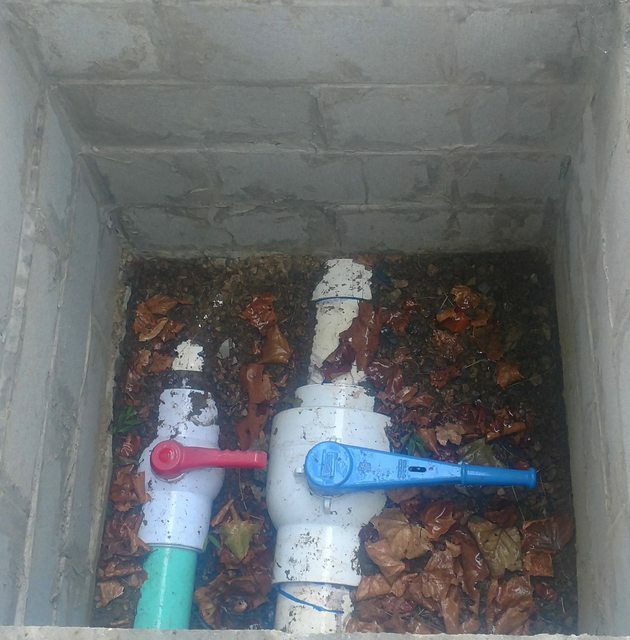 Edit: I looked at your original post and can see the separate pipes in your pictures. The irrigation pipe looks to be the one at a 90 degree angle sticking straight up. 4 years with a skid steer, that is an amazing accomplishment! Incredible! That is some first class work! I understand the concern in having a pipe through the dam. I have made previous comments in this thread about systems that could possibly work for anyone no matter their location. I know that your design does work and has been doing so for quite a while. Let’s say that you had a large dozer and it could be completed in under a month. What if anything, would you have done differently? I like Rainman’s idea of being able to manually start the siphon and having access to the vent pipe and a valve through the larger vent supply pipe that reaches the surface of the top of the dam with a grate. I really love what you have done with the irrigation pipe. You got me thinking is there a way to run the irrigation pipe without piping through the dam? If I could have had somebody build the dam in under a month, I would have skipped the construction drain. I would have either included some valves on my siphon drain with access to the pit or put in an additional pipe for the irrigation. Maybe a 4 inch pipe buried through the dam at water level and down to a valve behind the dam similar to the siphon drain but without the vent. It would have required a pump to get the line full of water and then worked as if the pipe was straight through the base of the dam. Could be used to draw the pond down and or to water my grapes and berries. For irrigation I would have the inlet about 6 foot deep as mine now draws from 17 foot deep and smells like rotten eggs. I am referring to the the vent pipe not the vent supply pipe. The part of the vent pipe extending to the surface of the dam straight above the crossbar TEE and capped. It would also be directly above the TEE on the siphon pipe. This would be for the manual starting of the siphon. Check valve or not? What do you think? Attached is a diagram of what I was describing about the placement of the check valve in red. I was also wondering if I could place a ball valve that could be accessed on the vent pipe inside the vent supply pipe in the diagram? I'm not sure whether the ball valve has to be on the crossbar of the vent pipe? All comments appreciated! Anyone? I realize most are very busy right now? I don't believe a check valve is necessary. It would probably hinder the filling process, and could potentially fail if a small piece of trash becomes embedded in the seat. It's just as easy and less expensive to simply close off the vent tube after filling it with water. And yes, placing the ball valve on the vertical drop of the vent tube will work just as well as placing it on the horizontal crossover. Thanks for the response! That is great to know that the ball valve can be accessed through the grate on the vent supply pipe. Just so I understand correctly, the check valve will not be necessary. 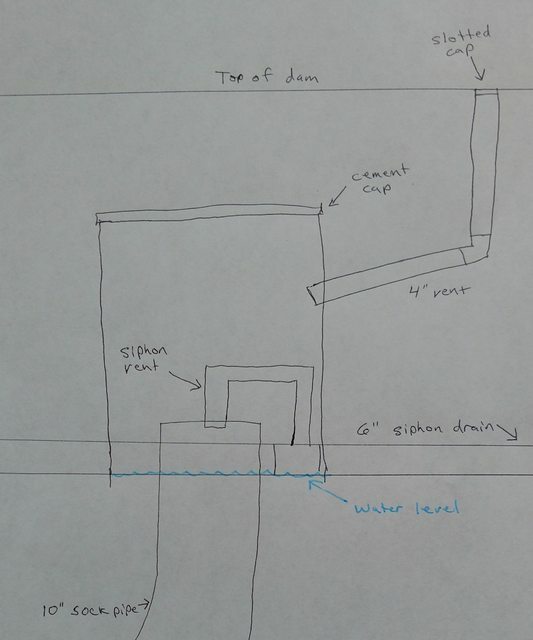 The reason I ask this question is because I’m unsure if the amount of air in the vent pipe (valve open) and capped surface of the dam will interfere with starting in automatic siphon mode? Will the siphon overcome the air in the system? Thanks for posting the links. I have seen the drawing and the main difference in this system is that I wanted there to be a design that anyone could use no matter where they were located. I want this system to work from Florida to Alaska. The drawing you linked has a potential problem with trash (debris or bees nest) blocking the vent and being broken when mowing especially in southern climates. In northern climates you potentially have those same issues along with an ice block in the vent pipe. 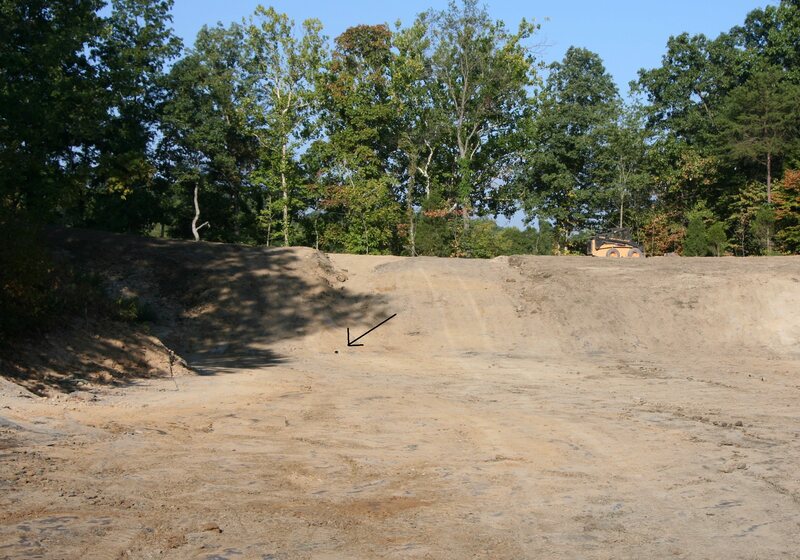 If the vent were blocked in either circumstance the pond could completely siphon. You are correct the concern I have being the extra length of pipe between the tee and the cap (I will call this part the riser) in starting the automatic siphon. Frost lines vary throughout our country. In areas there is no frost line and in others it may be as deep as 6 feet or more. This is why I initially asked about a check valve. If there were an issue with the riser (which you don’t think there will be), can an air bleed be installed underground on the riser and not have a problem with manually starting the siphon? I’m just trying to find a solution for everyone who wants to use a bottom withdrawal siphon system. I figured with all the knowledge on the Pond Boss Forum we can find an answer. I’m really looking forward to your response to the comments after your previous post.